Celebrity love life is full of break-ups and make-ups – but that’s what we love about them – you never know how long this or that couple is gonna last and how nasty the split turns out to be. However, not all former celebrity couples end up hating each other. Some celebrity splits are indeed amicable and some former lovers indeed remain friends when the relationship runs its course. Nick Jonas and Selena Gomez started dating in 2009. The couple split several months later but remained friends. “Friends” Nick and Selena eventually became so close they reconciled in January 2010 (and split again in April). Now they’re really nothing more than Disney pals. Brad and Jennifer married in 2000 and divorced in 2005. Despite all those nasty rumors regarding the divorce and Jen’s relationship with Pitt’s new love Angelina Jolie, Jennifer Aniston and Brad Pitt have remained real friends despite the split. In their many interviews both actors say they “keep in touch” and often call and text each other. The year Brad married Jen, Angelina Jolie married her second husband, Pushing Tin co-star Billy Bob Thornton. At the wedding they famously exchanged vials with each other’s blood instead of rings, remember? The couple divorced in 2003 but blood ties obviously seem to be strong. In 2010 Billy Bob said he and Angelina had remained close friends since the split. Miley Cyrus and Nick Jonas were each other’s first love. Young Disney stars met some six years ago and dated on and off for almost two years. Splitting for good in 2007 the couple has remained friends and even collaborated on a couple of songs as well as a new duet album set for release this year. Reese Witherspoon and Ryan Phillippe had been married for six years before finalizing their divorce in 2008. They’ve never said anything bad about each other and have remained on good friendly terms for the sake of their two children, Ava, 10, and Deacon, 7. They’re rarely seen together (if ever) but sometimes there’s nothing wrong about keeping distance, right? They married in 2004 after several months of dating. After two years and two children together Britney filed for divorce in fall 2006 citing irreconcilable difference as the reason for the split. Omitting Brit’s following meltdown and all the messy child custody disagreements, Spears and Federline have managed to reach a consensus (again for their boys’ sake) and now though Britney hasn’t yet been granted joint custody of her sons, she has extended visitation rights and can spend a lot of time with her kids. As to their relationship, Britney and Kevin are now just parents to their sons with all those joint baseball game visits and stuff. JT and Cameron ended their relationship in 2007 after almost four years together. The former couple met again on the set of their new movie Bad Teacher and seemed to fully enjoy each other’s company while making the movie. A great example of celebrity friendship post break-up. They separated in fall 2010 after 11 years of marriage. Despite the split the former husband and wife remain close and often spend time together. Maybe it’s their 6-year old daughter Coco that keeps them together, maybe it’s just that they still love each other. Ashlee and Pete announced their divorce in February this year. Despite that, they’re often pictured laughing and flirting, holding hands and being quite affectionate. In his many interviews Pete says he still loved Ashlee and doesn’t want to divorce. Ashlee doesn’t comment on the issue but actions speak louder than words – these two are not only friends, they still seem to have a chance for reconciliation. We’ll see what’s gonna happen next in the Wentz-Simspon divorce drama. They married in 1987 and divorced in 2000. Demi remarried five years later with Bruce following in her footsteps another four years later. They’re divorced but they’ve never been closer! They visit each other’s movie premieres, spend time together with their three daughters, and even vacation together. 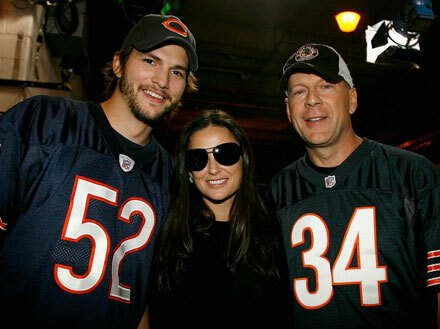 Furthermore, Bruce Willis is a good friend of Demi Moore’ new husband Ashton Kutcher, and Bruce’s new wife Emma Hemming is a real Demi lookalike. For some couples like Demi Moore and Bruce Willis, divorce is the best option to remain friends post split.